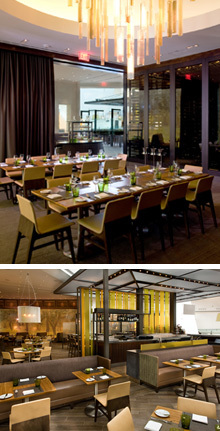 offering casual French cuisine and the most unique view inside Crystals at CityCenter. From late night gatherings to early morning brunches, let`s celebrate spring together. Located inside Crystals at the new CityCenter, Wolfgang Puck is proud to open his first French restaurant in nearly 30 years. Utilizing his extensive background and experience in French cooking and his contemporary and inventive style, Wolfgang has created a modern brasserie menu where guests can find his interpretations of traditional French classics like our passed appetizer Petit Croque Monsieur with Toasted Smoked Ham and Gruyere Cheese, or our Roasted Beet Salad with Candied Walnuts and Fromage Blanc. Guests can enjoy entrées including Seafood Risotto with Sweet Shrimp, Lobster and Tomato; Roasted Rack of Lamb with White Beans, Feta, and ‘Salsa Verde’; or our Pan Roasted Filet Mignon “Au Poivre” with Garlic Spinach and Roasted Potatoes. The crisp, modern interior exudes an inviting and warm ambiance providing a striking background to any event or private dinner reception. Brasserie PUCK can accommodate plated lunch and dinner functions for up to 60 guests, or reception style for up to 75 guests. The restaurant is available for exclusive buyouts for up to 180 guests seated and 300 reception style. Take your cocktail reception to new heights in our stunning bar and lounge that expands onto the light-filled terrace of the shops, making the restaurant both highly visible and inviting and offers guests the perfect vantage point to watch the bustling activity, special design effects and magnificent architecture Crystals has to offer. Spring is here and so is engagement and wedding season! 2010 trends are going bold, bright and full of color. Traditional pastels are a thing of the past. Bright orange, yellow and turquoise will be the primary colors this spring. The combination of yellow and turquoise is a beautiful, playful palette for any spring celebration. Bright orange and peach tones add an elegant contrast to a bride’s simple ivory gown. Going back to the basics will be another huge trend this spring. Events will focus on the attention to detail, not the drama of the evening. The popularity of home weddings allows for a more intimate setting perfect for smaller guest lists. Wedding cakes continue the trend with buttercream frosting replacing fondant this season. No matter where your wedding or occasion may be, allow Wolfgang Puck to share in the details of your special day with our catering services. Our professional consultants are here to assist you plan something "contemporary and colorful" or "traditional and timeless." How does your love stack up? Perfect for your Mothers Day brunch, these light, fluffy pancakes will warm Mom`s heart and bring a smile to her face. In a small bowl, whisk together the egg yolks, sour cream, milk and melted butter. In a large bowl, sift together the pastry and all-purpose flours, sugar, baking powder and salt. Make a well in the center of the dry ingredients, pour the egg-yolk mixture into the well, and whisk just enough to incorporate into the dry ingredients. In a clean bowl, with a clean whisk, beat the egg whites until shiny and firm, but not dry. Stir a little into the batter, then fold in the remaining whites. Heat the griddle and butter lightly. Over medium heat, using a 1/4-cup measure, pour the batter onto the griddle. When each pancake is golden brown on one side, and small bubbles appear on the surface, turn with a wide spatula and brown the other side. As the pancakes are cooked, transfer to a tray lined with a clean towel and keep warm in a low oven. Arrange 3 or 4 pancakes on a warm plate. Serve with warmed pure maple syrup or fruit syrup. Garnish with a few slices of seasonal fruit and serve immediately. To make fruit syrup, combine 1 part fruit (blueberries, sliced strawberries, or any other berry, sliced peaches, or plums) with 3 parts maple syrup and a little grated orange rind. The fruit can be pureed, if desired. Serve warm. Recipe courtesy of Wolfgang Puck. Visit our Recipes page online for more great recipes & tips. "The dinner we hosted in Brasserie PUCK`s private dining room was the highlight of our week in Las Vegas! We were able to customize the evening to provide exactly what our group was looking for…a relaxed, fun atmosphere, with a variety of amazing menu selections. The staff at Brasserie PUCK made the entire experience a pleasure - everyone we came in contact with made us feel like they were there to do whatever it took to make our event a success…and they succeeded at that!" Wolfgang Puck Bar & Grill at MGM Grand is the best choice for groups looking for a fun, casual, comfortable place to dine after a late show or celebration. Whether your night is winding down or just getting started, our late night menu is available from 11 pm to 6 am and features Wolfgang Puck`s contemporary twist on all your classic bar & grill favorites. Enjoy grilled meats & seafood, small bites, wood oven pizzas and hearty breakfast items in our Private Dining Room for 18 guests or our Glass Room that accommodates up to 40 guests.